Tonight Ocean Beats is moving away from their normal Ocean Beach Winston's location to bring the Bass to The Ruby Room in Hillcrest. 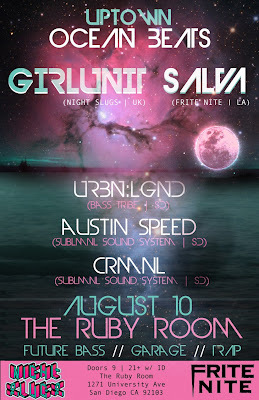 Ocean Beats really packed the bill tonight, Girl Unit and SALVA alone are enough talent to draw a headlining crowd, the fact that they are playing together with great local support including URBN:LGND is going to make tonight a night to remember. Girl Unit from the UK has a knack for making amazing sound spheres by combining vocal hooks with elements of R&B, Hip-Hop and electronic music. Girl Unit's single Wut is known in the electronic community to be one of the best singles of 2010-2011 and he has shown he has a lot more in him with his great new Club Rez EP. Salva is a San Francisco native now living in LA coming to San Diego fresh from the festival turned water park Lollapalooza and one of the most talked about DJ's at this years Lightning in a Bottle festival. 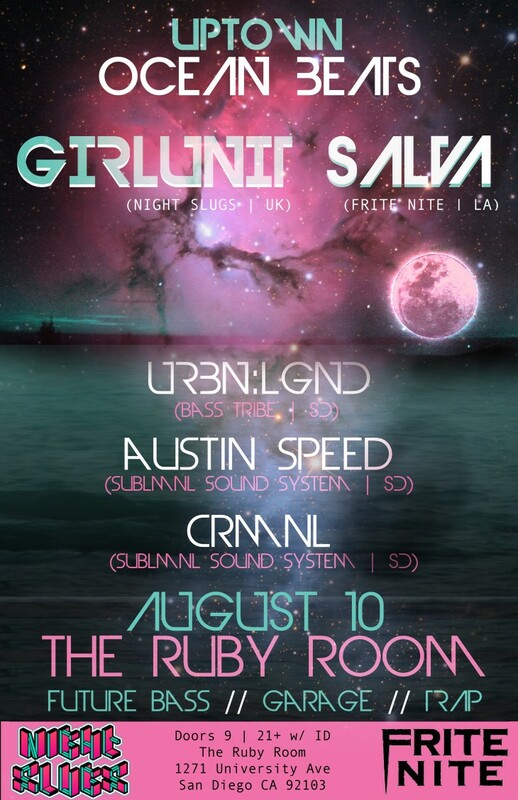 Make sure to get to the Ruby Room early as URBN:LGND is first on, even though she is listed as third on in the poster she is actually first on. She gets on at 9:00 and if you RSVP on facebook it is only $10 to get in before 10:30.